The USAID Community Forests Program (CFP) is a 5-year (2014-2019) project being implemented in Zambia’s Muchinga and Eastern Provinces by BioCarbon Partners, Ltd. (BCP). 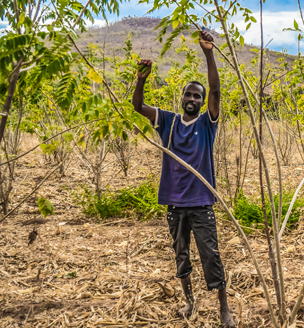 CFP is designed to support the Government of Zambia’s Reducing Emission from Deforestation and Degradation (REDD+) strategy by establishing the largest REDD+ program in Zambia and piloting innovative approaches to participatory forest management. The project aims to: reduce carbon emissions from deforestation through participatory natural resource management; increase the number of hectares of forestland under improved management; and enhance livelihoods through the development of non-timber forest products and alternative income-earning opportunities to unsustainable charcoal and timber production. USAID is supporting the design and implementation of a rigorous impact evaluation (IE) of the CFP to measure the key development impacts of project activities on communities and households. The IE will employ a Difference-in-Difference methodology to measure impact, using baseline and endline evaluation data to compare changes over time between communities in Zambia receiving the CFP intervention and communities in Zambia that are not receiving the CFP intervention. The IE is designed to examine the relationship between the project intervention and a number of outcomes, including improved: local capacity to sustainably manage forests; climate change resilience; tenure security; and transparency, accountability, and representativeness of customary forest governance institutions. Comprehensive quantitative and qualitative baseline data was collected prior to the start of CFP activities from March to April 2015. A Baseline Report, Design Report and other materials have been drafted and are available on this page. 6 Chief Key Informant Interviews. Baseline data show that the majority of households in the study area reported access to forests located on communal land. Alongside high rates of forest access, the household data also reveal that the use of forest products is important for local subsistence, as 84% of survey respondents reported collecting at least one forest product for home consumption. At the same time, the overall condition of nearly half of forests in the study area (42%) was noted by households to have worsened in the past three years and forest degradation was ranked among the top five development problems faced by over 40% of households. The further data reveal that forest-related decision making in the study area is primarily in the domain of customary authorities, with nearly three quarters of all household survey respondents identifying the Headperson or the Chief as the most important decision-maker. Very few households reported any personal involvement in local forest governance.